“Ahhhh”, I winced in agony, knowing it was too late. My fate had been sealed, or rather the fate of my tires. Thankfully, I had an emergency fund. But first, I had to make sure we were okay. I was driving my brother to drop him off at the airport when I slammed into a pothole on the passenger side of the car. In retrospect it was more like a sinkhole, mercilessly engulfing anything that tried to pass over it. Anyone who’s ever been in Philly knows exactly what I am talking about. Before impact, I frantically tried to veer out of the way, but I was boxed in by cars in the lanes on either side. I clenched my teeth and closed my eyes for a split second as I braced for the slam. As if on cue, the car started to wobble and the unmistakable rattling of the wheels signaled that a tire had blown out. We were glad we were safe, but the damage to the car was worse than we expected. Both passenger tires that hit the pothole had blown out. In what almost seemed like a scene out of a movie, five other cars pulled up behind us over the next 45 minutes, having hit the same pothole and gotten flat tires. For most people, needing to replace both tires would be a financial catastrophe. But for us it was simply an inconvenience thanks to having an emergency fund. In fact, our emergency fund was there for exactly this type of unexpected event. 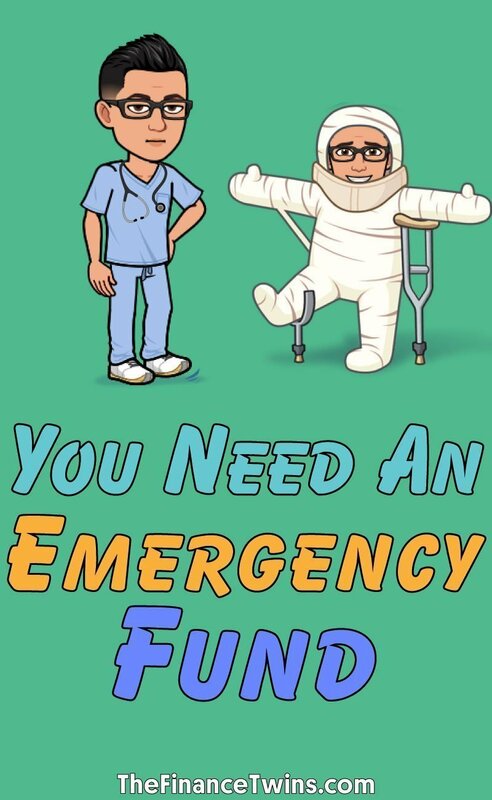 An emergency fund is a fancy word for money set aside in case of an emergency or unexpected expense that can’t be delayed. An emergency fund is sometimes called a rainy day fund or emergency savings fund. It’s not a specific type of account. It’s just any money that you have set aside and will not use unless it’s an emergency. And no, joining your friends for dinner because your paycheck is late is NOT an emergency. We are talking about medical emergencies, broken-down cars, maintenance problems with your home, etc. Real emergencies. Some people think of their emergency fund as a minimum balance or a floor for their savings accounts, which they don’t allow themselves to dip below (unless it’s a last resort). In this post, we will dig into which types of accounts are great for this, and how much you should save, but first, let’s discuss why you even need one. Isn’t a credit card a good enough back-up source for cash? No! Life is unpredictable. It is full of amazing experiences, like when your favorite team wins the Super Bowl or World Cup. Or the person you have a crush on says yes to go on a date. On the other hand, cars get towed, unexpected bills pop up, or you get sick on a hiking trip. Most Americans don’t have $500 in savings. This means that an unexpected bill can set you back months or years if you start racking up credit card debt just to get by. Interest on a credit card can be more than 20%, which is freaking insane. Like, so insane you’d be set for life if you could loan money at those kinds of rates. Credit card debt is a slippery slope you need to avoid at all costs. Emergency events often happen unexpectedly and give you no time to prepare. That’s when the emergency fund steps in. Pop a tire on a huge pothole driving to work? The emergency fund can help cover the cost. An unexpected event can make a huge impact on your life. If your car breaks down and you are unable to cover the repairs, you may lose the ability to get to work and lose your job. The point of an emergency fund is to protect you from extended hardship. An emergency fund will help you get back on your feet as quickly as possible. Saving up a little bit of money each month can help protect you, your family, and your future. This is why saving an emergency fund should be your #1 priority. Even before saving for retirement. 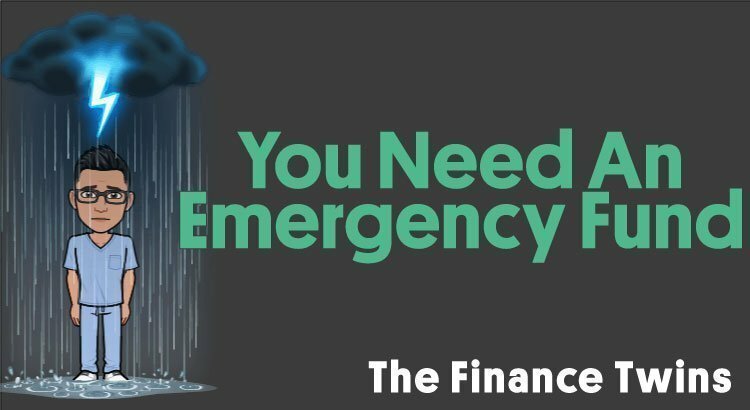 Put as much money into your emergency fund as you can to begin with. How Much Should I Set Aside in Emergency Savings? How much you set in your emergency fund depends on your income and how much you spend each month. Early on you may only be able to set aside $120 by saving $10 each month for a year. Setting aside $40 each month can add up to nearly $500 after a year. This will put you way ahead of your peers, and is a perfect example of the effectiveness of a monthly budget. If you depend on a car for your daily obligations (going to work, grocery shopping, etc.) you should set aside $1,000 as quickly as you can. Car repairs are often expensive and essential depending on where you live. Basic living expenses are your rent, groceries, minimum loan payments, etc. This ensures you are protected in case you lose your job or are disabled in an accident. Disability insurance can help you if you become disabled and cannot work. However, they often do not start paying you for 3 months. If you have disability insurance through your job, look into how long the waiting period is before you would receive payments. Saving up enough money to cover your expenses during the waiting period is a good idea. Not everyone is able to save up that much money in an emergency fund overnight, but the key is to save regularly. You should save the money in a different account than the one used for daily expenses. Leaving the money alone is just as important as putting it into the emergency fund, so that it is still there for a true emergency. It is also important to replenish the account after any emergency. The goal is to always keep the emergency fund at your target level or be working towards reaching it. This is true regardless of how much money you have. Even Bill Gates should set money aside in case of an emergency. Now that you know how much you should save, you might be wondering how to even save up. You essentially have two options (working on both is the best idea): lower your expenses or increase your income. Learning how to budget is the most important step in saving money. It will serve as your guide as you begin to learn about managing your money. Even once you have more money you’ll want to budget, so that you can accelerate your financial goals. Hopefully you will not need to use this money very often (hopefully less than once every few months). Because of this, traditional low-interest checking/savings accounts are not the best choice. This is because their interest rates are basically 0%. These are the banks like Wells Fargo, Chase, Bank of America, etc. The big dogs. Sadly, the big dogs don’t always play nice. Aside from low interest rates, they often come with balance minimums and other requirements as a way to charge you a fee. The last thing you want to do with your hard earned money is pay more fees! If you’re going to be setting money aside, you might as well make as much money from it, and every penny counts. Every damn penny! It sounds insane, but things add up, and over years of working, a single penny can compound into several pennies, which compounds into dollars, which then compounds to lots of dollars! This is why a high interest savings account is a wonderful place to save money! We like to use savings accounts at an online bank for a few reasons. They tend to have better interest rates than the large national banks and sometimes even smaller local federal credit unions. Try to find a savings account with at least a 1% annual interest rate. It is also critical to find a bank without minimum balance requirements or other fees for your emergency fund. Banks Varo, or Ally Bank are great options for this. They offer interest rates that are WAYYY higher than traditional banks and have no monthly fees. Boom. There’s no point in opening a savings account if the bank will take some of your money away in monthly fees. Another big advantage of online banks is that if you move you don’t have to worry about switching banks every time. We both moved to new cities for college and business/med school. Throughout all the moves we were able to keep our online accounts (though we did open and close brick and mortar checking accounts multiple times, until switching completely to online banking). Some people think that keeping a credit card on hand is good for an emergency. After all, a credit card is kind of like a loan that you can access at any time. However, credit cards are extremely dangerous in emergency situations. Consider the scenario where you lose your job. If you don’t have money saved and it takes you longer than expected to get a new job, you will begin to pay interest on your credit card debt. This will create a hole that will be extremely difficult to climb out of. You don’t want to make an emergency worse than it already is! It can be tempting to put an emergency fund into the stock market so that the money can grow. This is because if you go a couple of years without using the money you may begin to think that your money would be better off growing in the stock market. But this is more risky than it may seem. Consider that the stock market lost roughly 54% of its value during the Great Recession of 2008-2009. If you were laid off during that time or suffered a serious injury you potentially wouldn’t have enough money to cover your living expenses. It’s better to be safe than sorry when it comes to preparing for emergencies! Where Do We Keep Our Emergency Savings? The online bank we personally use is Capital One 360 Savings. However, we are likely to change to Varo or Marcus by Goldman Sachs in the future due to their higher interest rates! At Capital One, the interest rate is 1.75% on balances over $10K and 1% anything smaller, which is great. There are no minimum requirements and no yearly fees. Remember that this is a savings account so you need a checking account to access cash via an ATM. You can link your savings account to your checking account (does not have to be a Capital One checking account) to put money in or transfer it out. Capital One also have a large ATM network (they have ATM partners) so when you need to use the money, you can simply find a nearby ATM to get the cash if you also have a Capital One 360 checking account. Ultimately, we lived in cities that had Capital One locations making it convenient to stop in if needed. Admittedly, we have literally never actually walked into the branch for anything. One thing to note that won’t affect most people, is that you can’t make more than 6 withdrawals per month from savings accounts. Emergency funds shouldn’t be withdrawn regularly so this shouldn’t affect you, but if you think you’ll be taking money out a lot, stick with a checking account. Ally Bank is another great option with a slightly higher interest rate of 1.25% for their online savings account and worth a look. Many employers have credit unions affiliated with them in addition to local credit unions near where you live. Be sure to check their rates as that might be more convenient for you. If we find another bank with significantly higher interest rates and no minimums or fees, we may switch there. In general, the interest rates on savings accounts are going to be pretty low. The MOST IMPORTANT factor for your emergency fund is to find a bank account with zero monthly fees. The last thing you need when you are hurting for money is to be paying someone else fees. If you have an emergency fund and are curious what else you can do, check out our personal finance guide! It’ll help you prioritize personal finance decisions, so you can continue to rock them. Question for you: Where do you plan to keep your emergency savings? Great article and thanks for the recommendations on where to save your rainy day funds! Thanks for the good article. I have long been studying books on personal finance. Every month I save at least 10% of my income. I invest the deferred money in stocks or just lay on the bank account. At my university, students do not know how to properly handle money, I have to teach them investments. I decided to write an essay on investment and tell about it at the university.